January seemed really fast and slow to me. It's fast because it's already the 31st! It's slow because I can't wait to go to my road trip next week! And I can't wait for yearend and winter to be over! Well, it's the end of the month, so this means it's going to be end of month favourites! It's the first favourites post on this blog, so I'm kind of excited =). Anyway, let's get to it! I got this miniature version as a 100-point perk from Sephora. It has a silky finish like some other silicone primers, but unlike those primers, this doesn't give a heavy finish. I usually use it around the nose and on the forehead. I think it gives a smooth base for makeup and it does cover up the pores around my cheeks pretty well. If you want to try it out, I still see it as a 100-point perk in some Sephoras, so you might want to check it out =). Drugstore products have been wowing us for a while (lol). As you can see on my blog I have been talking about a variety of drugstore rave, like Maybelline Color Tattoo and L'Oreal Infallible Color. Now it's time for something more obvious - Revlon Colorburst Lip Butter. They might as well call the Revlon Colorburst Lip Butter as "I-cannot-believe-this-is-not-..."
Last week started off with an outfit idea post featuring few items from my Best Fashion Finds of 2011. It is nice to show them in action to show how much I enjoy these pieces =). Read more about them here. Two days ago, I attended a product launch party at the Toronto Lomography store with two blogger friends Joyce from Sparkly Playground and Emily from This was Forever. There was no new cameras out, but they did have some new skin for their existing Diana+ and Fisheye Cameras. It was a chill out party with new cameras, music, food, wine and cheese. It was quite fun. Besides, the store itself is very cute. It is decorated with film photos and the display for the cameras are very appropriate. So if you're around Queen St. x Bathurst Street area, go check it out. I think I am doing quite well with my fashion posts this week, right? I mean, it's only Thursday, and I got two fashion posts out =D (patting myself on the back). I think I need to try taking more pictures outside during the weekend so that I can have regular fashion posts! 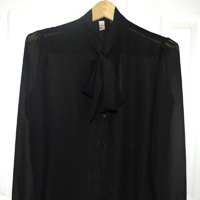 Anyway, this is another outfit idea post, and our feature today is my Talula Betsy Blouse. Hi, I am on a blush roll (get it? LOL). Anyway, here's a new series called "Which is which Wednesday". Basically, the idea is to find a few look-alike products and see if you can identify which is which. Since I don't have a lot of dupes in my collection, this might be an irregular series. Anyway, the first time WWW features pink blushes. A week ago I posted my thoughts on the new Benefit Hervana Box O' Powder. I think that Hervana gives me a pink glow, which is unlike other pink blushes that I have tried. 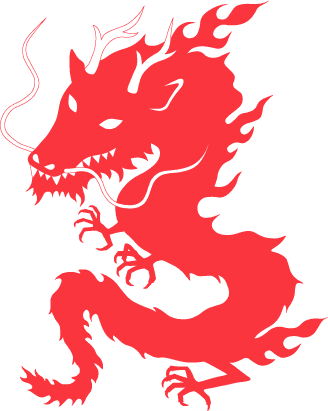 It's a day late, but Happy Chinese New Year! (Or if you prefer Lunar New Year). Last year's CNY was pretty great. I was working at a bank back then and all my coworkers were Chinese. So it was pretty festive, everyone is wear red. We also went out for a CNY lunch. The little kid in me enjoy getting red pockets from the "adults" the most, I even got some from my customers! It was quite surprising, as I did not expect that to happen at all! This year, however, there wasn't much celebration going on for me. 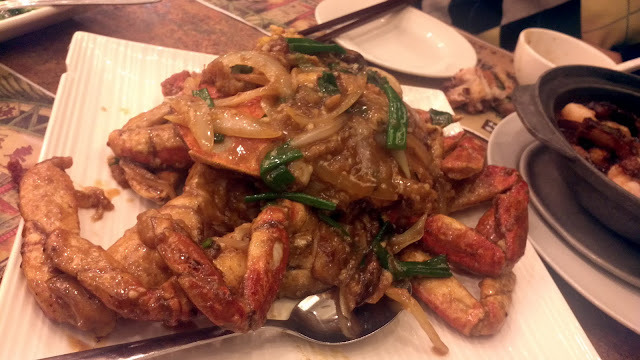 I did have dinner with my family and relatives last Friday, and then with my roommates this Monday. But that was it. Oh well, but it's a brand new year, so I must be hopeful about how this year goes! 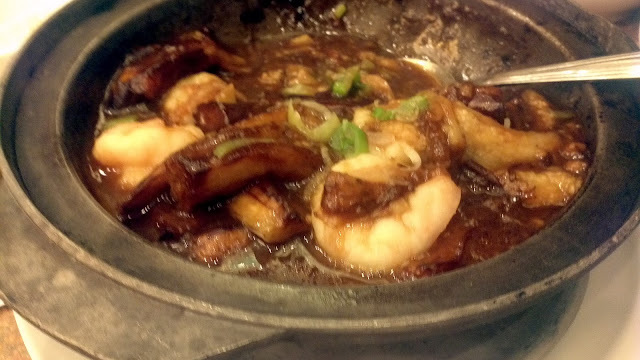 Anyway, here are some food photos from last night's dinner, excuse the phone quality photos. Nom, nom, nom... I want more food LOL. 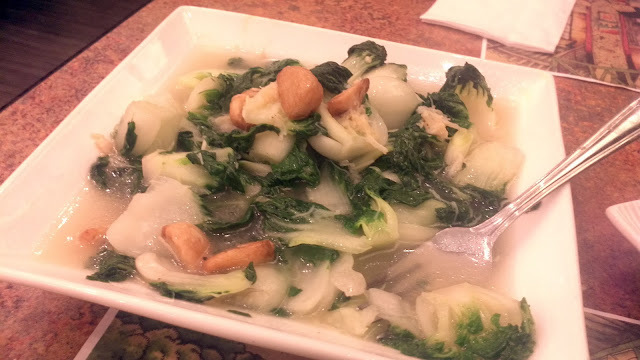 I hope you all have had a wonderful Chinese New Year even if you're not Chinese. I recommend checking out your local Chinese grocery store. They put out some pretty festive snacks and food during this time of the year =). 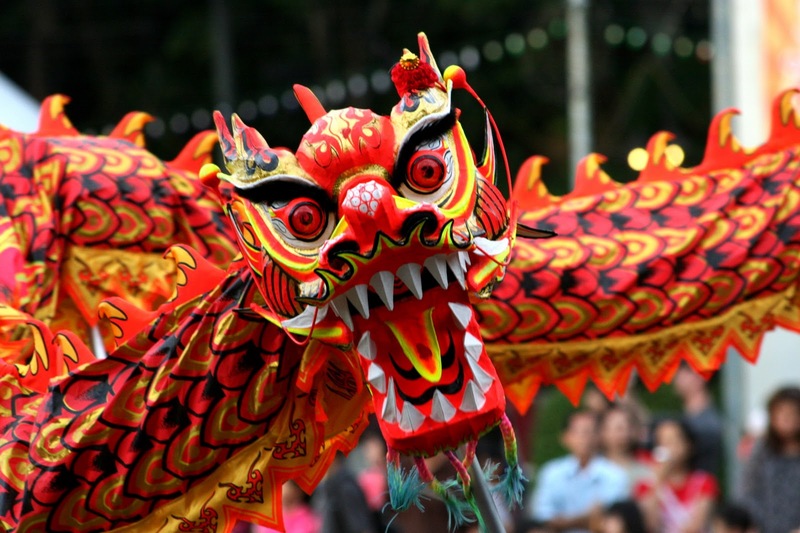 Chic Chat: Happy Year of Dragon! As you might remember from last Monday's post, I talked about my weak and brittle nails and what I was going to do to try to fix it (See "Essie In Action: Weak Nails Saver... or Not?"). I promised that I will report my progress after one week of use. First, let's take a look at my nails. Why did it got shorter? The answer is simple, the absent-minded me cut my nails =(. Oh well, but I could tell you that it has gotten longer. I don't usually file/cut my nails every week. So please forgive my stubby nails. Did my nails Grow Stronger with Essie's Fortifying Growth Treatment? Back to my outfit idea... I have worn this outfit for a couple of times, but I have not been able to photograph it. So rather than waiting till I actually wear it during the weekend/holiday/vacations, I decided to just throw it on and snap a few pictures. It's Saturday, but I got a lot of errands on my list. So I can't help but slacked a bit in the outfit department. My go-to comfy outfit is always sweatshirt + leggings/jeggins (I tend to buy long sweatshirts). Here you'll see two of my favourite fashion finds of 2011 in action (yay)! Can you see the "fog"/"smoke"/"I-don't-know-what-it's-called"? I know I am a bit late today... but I am here to talk about things that will get censored if SOPA passed... I respect intellectual property, but with SOPA, everything is blocked when there's a slight indication that it might be a copyright infringment... Imagine life without YouTube, Facebook, Twitter, Tumblr, etc. I love reading blogs, but if blogs got censored... Our freedom of speech will get censored too. A lot of major tech giants are opposing SOPA, such as Wikipedia and Google, even our fellow YouTube beauty guru xSparkage are blacking out to voice their opinion! I am not blacking out today because let's face it, my blog is too small to show significance. But I am here to spread the word and I urge you to read more about SOPA and PIPA. Let's STOP SOPA and free the Internet. Visit this page to read more about it and see how you can help. It is the newest addition to the Benefit Cosmetics makeup line. A lot of people have jump on it when Sephora had a one day flash sale back in December. Afterwards, I have only seen rave reviews about it. So when I saw the display was up at a local Sephora, I knew I had to get it. 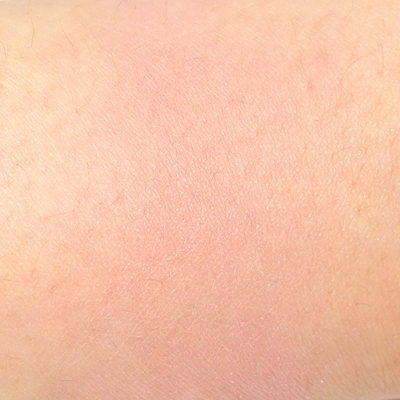 Benefit describes it as "an orchid-blossom blush with a satin finish". I think this description fits the product really well because I do think of an orchid colour after I apply it on my cheek. I've been wearing it every day since 2012, which is a good change from my exhaustive use of Tarte Amazonian Clay Blush in Exposed. I like that it is soft, but still visible, it truly gives you an angelic-glow. Yet it can be natural enough, depending on how much you apply. It's like the flush you see on dolls, it's heavenly! For the past couple months, my nails have become so dry and brittle. That has to do with a lot of things: the dry weather (check), me being forgetful about applying hand cream (check), unhealthy diets (not quite, but possibly because of lack of certain vitamins/minerals). I have taken actions to try to mend this. It has become better, but weather is still dry and I am still washing my dishes (not to mention I feel a need to wash my hands every half an hour), so my nails are not in its best condition in the moment. I have been hunting down this product lately that I have read great reviews on. I have finally found it in a not-so-local Walmart! It is the Essie Grow Stronger™ Fortifying Growth Treatment. When I first saw this on the Internet, I thought it'd be sold anywhere. You'd be surprised how many salons, Trade Secrets, Walmarts, and Shoppers Drug Marts I have been, and yet still couldn't find it. But now here it is! 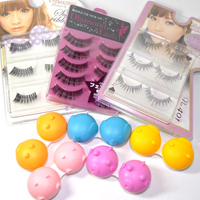 On New Years Day, I placed a huge order at PinkyParadise.com because they were having a sitewide sale on lenses. It was quite a bit of savings, so I decided it's time for me to get some new Asian beauty products. So here's a sneak peek of what I'm going to test out! Happy Sunday everyone! It has been a very eventful and productive week. First of all, The Office Chic was officially launched last week on January 8, 2012 (yay). I'm so excited to be back on blogging, and I can't wait to put more posts up on this blog! But let's rewind and see what went up on this blog this week =). It was fun, but weird! I'm going to try it again today, since the weather looks kind of nice (at least there's sunlight). So let's hope everything goes well and I could put more outfit and fashion posts up! Speaking of clothes, I am trying to figure out how to use more current wardrobe more efficiently because it's been cluttering up. My goal is to only buy key pieces that are timeless rather than filling it up with clothes that I don't touch often enough. IMO, the item is worth its price if you get to wear as many times as you pay for it (so $1 each time!). Is that weird? LOL. 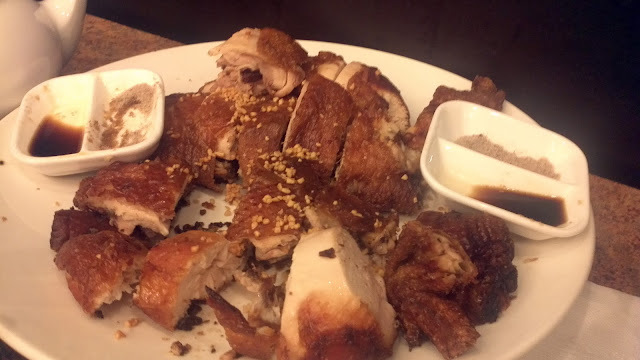 Sunday Summary (Jan 15, 2012): This blog is a week old! As I have mentioned in my Marcelle & Annabelle Beauty Premiere post (read it here), one of the most exciting launches for Spring 2012 from Marcelle is indeed their BB Cream. I'm obsessed over BB Cream, I've tried maybe 10 of those, and I don't think I'm going to stop here! This is definitely a must-try for me, because it is the first Canadian BB Cream, which makes it awesome (proudly Canadian LOL). From the press release, this BB Cream is supposed to be a "Multi-tasking Skin Enhancer". Not only there are multiple ways to use it (as a moisturizer, as a light foundation over moisturizer, and as a makeup base for extra staying power), there are also multiple benefits from using the Marcelle BB Cream! Let's take a look what Marcelle has to say for this brand new product! Marcelle® proudly introduces the first Canadian-made BB Cream formulated specially for Canadian women in pharmacies as well as mass retail stores! The Marcelle® BB Cream will be in stores on February 6, 2012. 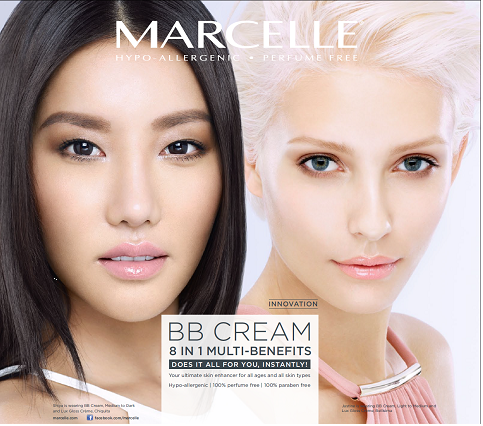 Inspired by a trend that perfected skin and enhanced complexions all over Asia, Marcelle® formulated its own BB Cream to cater the needs of Canadian consumers. This multi-purpose skin care cream is more than a tinted moisturizer or simple make-up base. It perfects the skin to reveal a more even epidermis and well-hydrated, flawless complexion, all in one. Ideal for any age and any skin type, the Marcelle® BB Cream comes in two shades and is suitable for a wide variety of carnations thanks to its self-adjusting pigments that transform and adapt to skin tone. Marcelle does BB Cream Eh! Just two months ago, MARCELLE and ANNABELLE organized an event called the "Beauty Premiere" to reveal the new products they're releasing in Spring 2012. I was fortunate and honoured to attend the event as a Beauty Blogger. The event is more like a party. Everyone was enjoying hors d'oeuvres and wine, while hanging out with other beauty bloggers and checking out those exciting new products! It was definitely a lot of fun because I get to see my bloggers friends again, and meet a lot of new people as well! Lovely ladies from left to right: Abigail, Joyce, Jenn, Emily! The main event, of course is to get a sneak peek of what is coming out in Spring 2012. First off from ANNABELLE, are these Glitterama liners. Adding to the existing 7 colours, they are adding a few new ones (as I have been told). They look amazing, the pink one in particular, and I can't wait to try the new ones out! If you were a reader of my old blog (thank you! ), then you might remember I had a post about my depotting dilemma. Well, after months of debate, I depotted. I first purchased unii palette last year, and then the Z-Palette later in the year. I also have had my MAC palette for years, and here's a comparison of them all. I first decided to purchase the UNII Palette because of the packaging. This looks and feels really sturdy. When you open it up, it has a big mirror inside, which is awesome for travelling (you do not need to pack an extra thing). I also like that it included a grip inside, so it won't slip away and end up on the ground. It also has a tight lock that keeps the product secure inside. UNII Palette has since made an upgrade and converted them into magnetic plated palette, which means any metal pan would stick. To preface this, I should let you know that I have combination to oily skin and my skin is quite acne prone as well. My acne is mostly the result from hormone fluctuation during the month, so I am usually good for half of the month, and not so good for the other half. My goal is to find the ultimate skincare range that help me clear up my skin, even during hormonal times. Although I don’t wear false lashes often, I have quite a few different pairs of them in my collection. When I asked my friends to buy some more from Asia, one of my friends said: “You bought so many of them, but I’ve never seen you wear them”. So this gives me a motivation to wear falsies more often. 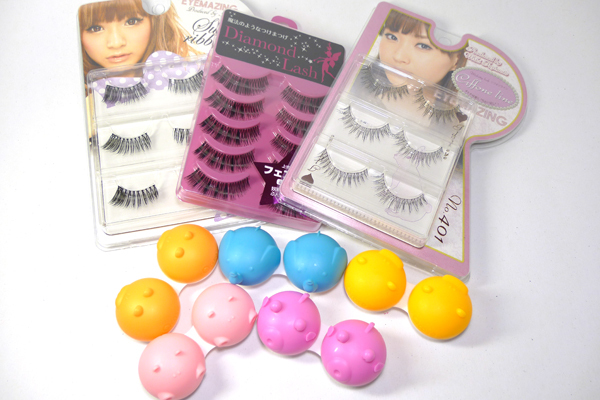 And lately, my go-to is always Dolly Wink Lashes No.4 Feminine Style. These have become my go-to false lashes because they are corner lashes, or accent lashes, if you will. However, these go a little further in than the other corner lashes, but they’re not all the way into the outer corner. This makes them ultra easy to apply (huzzah!). They give pretty natural length and an extra oomph at the outer corner. It might not be the most “volumizing” or doll-like lashes out there, but it gives just what I need. I have already shared what beauty products I have loved in the year 2011 (click here to view said post). I thought I would also share with you a few of my favourite fashion pieces I acquired this year. I think I am kind of on a roll with fashion posts =)... I'm already planning for another one LOL. Everyone needs a good blazer. I really like this one because it doesn't have the padding on the shoulder. I have pretty wide shoulders, that might not always be desirable. Without the padding this become more fitting and more flattering for my body. Hello, welcome to "The Office Chic". I am Rica, the owner and author of this blog. This is a place for me to share my passion and things I like. It is called "The Office Chic" because I work at an office environment by day. Business casual is our office attire, but I do like to incorporate extra things I like in my outfits. I believe that we don't have to dress boring to look professional, we can also be chic, and hence the name of the blog. The official launch of "The Office Chic"
It was so nice outside today. I was all dressed up for a mother-and-daughter date and ready to leave, but my roommate left the house with his key and his car was blocking my car. So there I was, wondering what I could do. 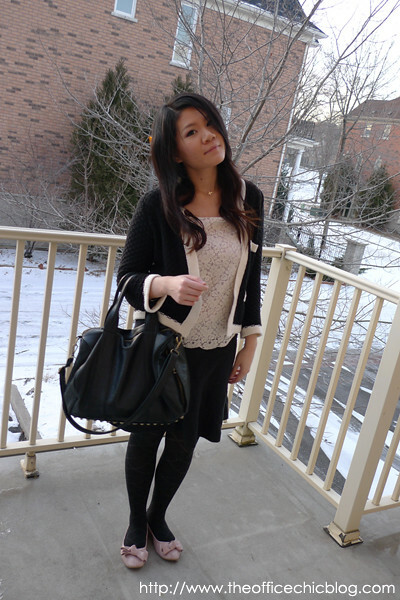 I thought it'd be a perfect opportunity to take some outfit photos as the first fashion post for this blog! So here we go! Trying to walk gracefully, but I kinda failed. It's a brand new year. And what a better way to set some goals, beauty related or not, for this year! NYR #1: Drink at least 8 cups of water every day. I don't think I drink enough water. I usually am able to stick with it in the office, but at home, somehow it's harder to do. So I'm going to use a water schedule for a month, and hopefully this will become my routine. NYR #3: Do yoga at least twice a week. I stopped exercising over a year ago, which is bad, real bad! With a full time job, this seems even harder, but I am going to make it work. I have already taken a tiny step and sign up for some yoga classes at a local yoga studio. Wish me luck!